Looks at the current condition of wolves in Spain, and the persecution they continue to face at the hands of a populace that is largely indifferent, if not completely hostile, to the notion of protecting wolves. The focus is on Luis Barrientos, a biologist who has dedicated himself to the study of Spanish wolves. 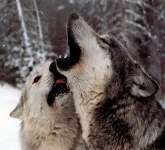 According to Barrientos, "the war against wolves continues" in Spain.